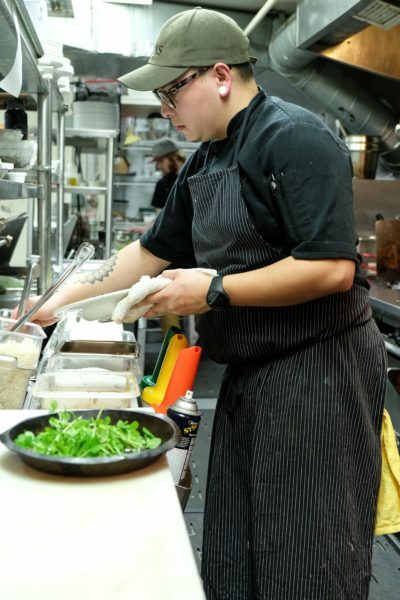 Chef Oscar Alvarado, Ashland Culinary Festival participant, prepares a dinner entree at Larks Home Kitchen Cuisine in Ashland. “Tourism is the front door to Ashland’s economy,” explains Katharine Cato, Director for Travel Ashland Director. She goes on to explain that Ashland welcomes over 350,000 visitors annually, and within that are more than 100 restaurants, an impressive per capita number for a small town. Sure, the Oregon Shakespeare Festival may be the main dish for most tourists flocking to Ashland, but restaurants are not just some side dish—and the month of February celebrates the quality, variety and style of those establishments with “Culinary Month,” including restaurant week (Feb. 5-11), which allows locals and tourists to explore Southern Oregon’s award-winning wine country, restaurants, food artisans, talented chefs and amenities. Previously the month of February saw a single culinary week in Ashland, but with the expansion to a full month, in a way, it really will kick off the tourism season in town. Tourists and locals alike are invited to enjoy special promotions at select restaurants, and a variety of other special events focusing on the culinary scene in Ashland. Month long specials this year include the chance to win a $25 gift certificate to a participating restaurant (multiple winners will be selected) and one winner will receive a culinary gift basket. Entry forms will be posted on the Ashland City Chamber website, ashlandchamber.com. Shared photos on social media using the hashtags #AshlandCulinaryMonth (required to enter), #AshlandRestaurantWeek and #TravelAshland have additional chances to win. Many award-winning chefs and mixologists honored in the Ashland Culinary Festival Nov. 2017 will be featuring specials, classes and promotions during the culinary month. Luna Café and Mercantile: Mention “Ashland Restaurant Week” to receive one complimentary chef’s choice appetizer with the purchase of two entrees, offered Monday, February 5 – Sunday, February 11 and cannot be combined with any other discount or promotion. Crater Lake Spirits Dinner: All-inclusive, five-course artisan dinner paired with craft cocktails, Saturday, February 17, 6 p.m.
Omar’s Fresh Seafood & Steaks: Fresh live oyster month: during the entire month of February, Omar’s will have at least six varieties of Fresh Pacific and Puget Sound in-shell oyster, prepared in a variety of styles. You can choose one variety or try the sampler plate. Menu items based on availability. MÄS: Pop-up, multi-course winter meals, Mondays for the month of February. $70 per person. Parties are limited to 15 people. ExploreTock.com/Mas. 59 N Main St.
Culinary month also includes happy hour at many participating restaurants, live music, tasting events, getaway package prizes, and other events and classes. The Irvine & Roberts Cooking Class featuring Chef Jordan Harto of Ostras Restaurant in Ashland, Feb. 6. Tickets for this Spanish Tapas event are limited to 14 people and are $75 for wine club members and $95 for non-member guests. Please email your ticket request to info@irvinerobertsvineyards.com or call the tasting room at 541-482-9383 Wed-Sun from 12-6 p.m.
Ostras! Tapas and Bottleshop cocktail classes every Saturday in February from 3-5 p.m.
$60 per cocktail class or $200 for all four. Includes 1 welcome cocktail and three (1/2) cocktails, and spirit samples equaling in three cocktails per guest plus bar bites.